My name is Nancy Offers from Newark, Ohio. I came to New Realm about 6 month ago because of ping in my mouth after cancer surgery in 2003. The cancer was on my tongue, tonsil and at the back of my mouth. After the first surgery, I had radiation treatment. In 2004 I had another surgery/biopsy and was found clean. In 2005 had another surgery/biopsy and cancer was found again. This time they removed ¼ of my tongue on the left side. Had my 4th surgery/biopsy in 2006 and again was found to be clean. This caused the nerves to be cut which caused more pain then before. A friend of mine suggested that I try New Realm. She and her mother went to Dr. GAO and his wife Jing and were very happy with them. I wanted to find something besides pills and pain management injections (which did not work). Dr. GAO and Jing gave me a new way to management my pain. When I first went to him I was really nervous, so nervous, that I was freezing cold. I hate needles, but he told me that I would not feel the needles as they were very thin. He was right. The only thing I felt was his hand on my face, ankles, hands and arms when he inserted the needles. At first I was going three times a week, then twice a week, now just once per month. The pain is not gone totally but it is manageable now. Before the treatments, I could hardy eat or drink anything because it hurt too badly. Now I can eat almost anything (except really spicy foods) and can drink anything I want without much pain. I know that the pain will never be gone completely but with Dr. GAO and Jing’s help, I will be able to management it. Have no fear about this wonderful procedure. It really can help. I know because it has helped me. God bless Dr. Gao and his beautiful wife, Jing. I, Peter J. Parkey was advised in November 2003 that I have esophageal cancer. A “G” tube was installed in my stomach for feeding, but I found out that “G” tubs basically are failures. 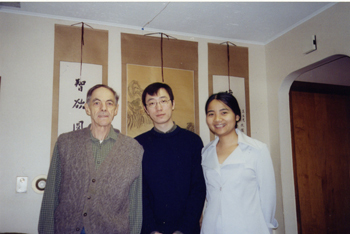 I came to New Realm Acupuncture in December for an acupuncture treatment and was to receive several. My esophagus was opened enough to receive solid food. I feel this treatment help me a lot, because historically esophageal cancer patients starve to death, the tube is too small to supply nutritional requirements. I had experience with acupuncture before, so when the doctors were telling me I had cancerous nodules on my thyroid I immediately decided to try alternative treatment first. The statistics were low that the nodules actually would be cancer and I wanted to see if I could reduce the size or make them completely dissolve before having surgery to have my right lobe removed or possibly my entire thyroid. Removal of part or all of the thyroid requires medicine indefinitely. I searched in the yellow pages for an acupuncturist and New Realm was the first place I called. I consider myself lucky to have found a good acupuncturist. After six weeks of acupuncture treatments, yoga, meditation, visualization and adopting a vegetarian diet, the size of the nodules reduced by half. I am on the right path and I feel with Dr. Gao and Jing’s help I will not lose my thyroid and my overall well being will be considerably better. Many thanks to them for their knowledge and compassion in dealing with me as a whole person and not just a symptom that walked through the door.